However, not all cultures that discourage honesty are fear-based. Even companies which boast a positive ‘can-do’ approach can handicap their critical programs by closing their ears to an honest voice. If the belief is that even wild and unrealistic plans are achievable, anyone who ventures a less than idealistic point of view can be vilified for being a ‘loser’, ‘cynical’ or ‘negative’. “A company’s collective inability to talk openly about its problems—is common. This lack of openness lies behind many failures to implement strategy,” say Eisenstat and Beer. A company-wide acceptance that honesty is less than helpful usually means that this belief has filtered down from above. Business leaders can be just as guilty of not being frank with themselves, both in terms of their own vision, and why the business needs a new strategy in the first place. A senior executive or CEO often comes up with an ambitious concept for change and tells their team to carry it out - without considering whether it’s even possible - and often without allocating adequate time and resources. Targets are not plans. And a program delivery team can find themselves fighting a losing battle from the very outset. “While having an audacious goal is not a bad idea, not having the resources, plan and people to execute it is definitely one,” says Infosys’s Ramachandran Guruswamy. Further problems surface when leaders fail to honestly acknowledge the factors that have led to the need for the new program. Combine all this with the inevitable and understandable reluctance of the team to report back honestly and the program is on very shaky ground. It’s up to senior executives to lead by example and approach a critical program realistically - and with humility. Mistakes may have been made in the past but without leaders being honest with themselves, they will be repeated. It’s clear that a lack of honesty can be damaging to a critical business program. So how can a business foster a culture of openness and sincerity? As well as the onus on leaders’ integrity, that culture is not possible without trust; an assurance that being honest and raising concerns won’t result in punishment or fall on deaf ears. At the same time, an open culture leads back to trust and helps to make create a cohesive and productive team. “Organisations can build a culture of trust by cultivating honesty and integrity in workers’ interactions,” (Williams, Forbes.com). When a business takes on an important program or plan for change, it’s crucial from the start that the program delivery team trust both the stakeholders - and each other - to hear and receive honest feedback without judgement or condemnation. Creating a safe space in which team members can speak openly is fundamental to this - as is the move away from any sort of blame culture. This way, when problems inevitably occur, they won’t be swept under the carpet but can be tackled head on by the team as they show up. Finally, a business should adopt evidence-based, rather than opinion-based, discussion. When the direction of a critical program is led by opinion, the most senior person in the room will always get their way. Indisputable facts are just that. They form a much more stable foundation than ‘opinion’ for any business program, as well as creating an open forum in which anyone on the team can put them forward. We agree, particularly when it comes to approaching a large-scale program. Without honesty at its core, plans conceived with the creator’s head in the sand can very quickly unravel a business-critical program. Mentor helps companies with every step of strategy execution - from mentoring management teams on the ins-and-outs of execution; diagnosing program states with our proven Independent Program Review; to providing real-time execution wisdom to you, as you work. And helping you to successfully accelerate change. If you crave no-nonsense, reality-based advice, get in touch now on +44 (0) 1189001252 for a confidential talk. Honesty is the best policy. It’s a lesson instilled in us from the moment we learn to speak – and a sentiment most people would agree with. Yet, in many businesses being honest isn’t valued as highly as it should be. All too often honesty is equated to negativity; a voice of doom that could potentially hold back or even derail even the best-laid business plans. But a lack of honesty from people in a business can hamper the chances of successfully planning and implementing critical programs that would enable it to grow and develop. Fierce competition and demanding clients dictate no company can afford to stand still. But without an honest attitudes underpinning a large-scale program, it’s unlikely to deliver the business result. So what stops people telling the truth in business? Here we examine the factors that contribute to a business diminishing honesty in their critical programs, and how you can create an open company culture that uses honesty constructively to inform plans for radical change. In many cases, undervaluing honesty relating to a critical program is indicative of a culture-wide problem. When company cultures are based on fear or blame, the pressure to project an image of success can prevent program managers from being honest about the program’s progress. ‘Bad news’, or simply telling it like it is, can be seen as decidedly unwelcome, and if program managers dread the reprisals of being honest – even fearing for their jobs – the temptation to sugarcoat the truth can be overwhelming. At Mentor, we call sugarcoating – ‘green-shifting’. Where problems can be categorised as red, amber or green, according to their severity, program managers who fear how their news will be received often report it as less serious than it is. Often wishing the problem away and convincing each other that it’ll be fixed before the next meeting, so “let’s not expose it at all”. So red becomes amber, and amber becomes green. By the time the red problems are too serious to ignore, it can be too late to do anything about them and the threat they are to the entire program. 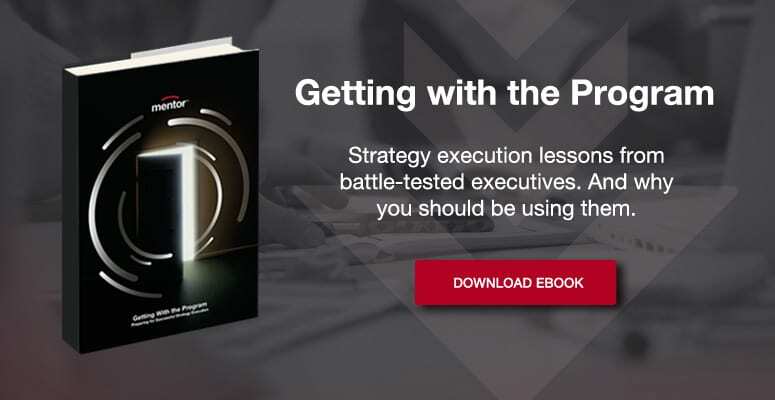 A senior executive or CEO often comes up with an ambitious concept for change and tells their team to carry it out – without considering whether it’s even possible – and often without allocating adequate time and resources. It’s up to senior executives to lead by example and approach a critical program realistically – and with humility. Mistakes may have been made in the past but without leaders being honest with themselves, they will be repeated. When a business takes on an important program or plan for change, it’s crucial from the start that the program delivery team trust both the stakeholders – and each other – to hear and receive honest feedback without judgement or condemnation. Creating a safe space in which team members can speak openly is fundamental to this – as is the move away from any sort of blame culture. This way, when problems inevitably occur, they won’t be swept under the carpet but can be tackled head on by the team as they show up.